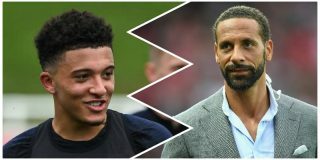 Manchester United legend Rio Ferdinand would welcome to signing of Borussia Dortmund starlet Jadon Sancho. According to the Evening Standard, United are confident they can persuade Dortmund to sell with a bid in excess of £80 million for the 18-year-old this summer, after watching his impressive breakthrough season in the Bundesliga. Sancho has scored 8 goals and 12 assists for BVB in 26 Bundesliga matches this season, helping the side put up a fight to take the title from Bayern Munich. Ferdinand is backing the potential move, insisting that Sancho has the ‘perfect mentality’ to thrive for United. “I would take him [at Manchester United] all day,” Ferdinand told Goal. “England, young, hungry and talented, that’s all I need to know. Sancho is currently preparing for the Euro 2020 qualifiers after making Gareth Southgate’s England squad, so it could be a good opportunity to play him against the Czech Republic and Montenegro. His form in the Bundesliga this season would suggest he’s ready for a move to the Premier League, but he knows what English football is about from his time at Watford and City. By the sounds of it, United are doing all they can to land Sancho, who would be an ideal player to bring in if we can find a new home for Alexis Sanchez.